French Revolution could use some help. Please research the article's assertions. Whatever is credible should be sourced, and what is not should be removed. Viva la Vida! Oh wait, wrong revolution. While there were several, the French Revolution (notice the capitalisation) generally refers to the monumental period beginning with the storming of the Bastille and subsequent overthrow of the established aristocracy (or Ancien Régime) in 1789[note 1] and ending with the declaration of the French First Republic in the fall of 1792. In a larger context, the French Revolution also includes the period of more general political upheaval until Napoleon's coup d'état in 1799. It was the best of times, it was the worst of times, particularly for libertine concepts such as democracy. For practical purposes, the French Revolution was merely the culmination of a long history of centralization in which regional governments and cultures became subservient to Paris. It represented the beginning of the end of feudalism[note 2] as well as the power of Enlightenment ideas. In the years leading up to the revolution, the aristocracy of France enjoyed lavish lifestyles during a time of near-bankruptcy while the masses lived in abject poverty. At the time, French society was divided into three castes, called estates. The First Estate was the clergy, the Second the hereditary nobility, and the Third, everybody else. The First and Second Estates were immune from taxation, resulting in mass discontent as the third Estate was subjected to increased taxes as a result of failed military engagements such as the Seven Years' War. [note 3] The situation was worsened by food shortages due to low crop yields, resulting in speculation that the worsening state of the populace at large was the result of a sinister conspiracy on the part of the First and Second Estates. Peasant[note 4] unrest was further exacerbated by the perceived arbitrary nature of government. Various thinkers, among them Jean-Jacques Rousseau, suggested that the situation could be improved by establishing limits on executive power. A nominal legislative body, the Estates-General (états-généraux), existed but was largely powerless and was dominated by the nobility and clergy due to a lack of proportional representation. Following the storming of the Bastille prison on 14 July 1789, mob rule took over France's metropolitan centers. Partly inspired by the American Revolution,[note 5] Frenchmen (and women) cast aside the aristocracy, performing citizens' arrests of nobility and anyone associated with them (including paid servants who would not cast aside their loyalties). King Louis XVI originally accepted the revolution, and allowed a new legislature, the National Constituent Assembly, to develop a new Constitution. This constitution, ratified in 1791, instituted a constitutional monarchy. Less than nine months later, the legislature voted to abolish the monarchy completely, paving the way for a more radical movement. A secular republic was declared on the autumn equinox of 1792 to replace the monarchy, and a second constitution was drafted. Church officials became employees of the state and a non-denominational church became the official "religion" (called the Cult of the Supreme Being ). In 1793 the Gregorian calendar was replaced with a new "Republican" calendar that stripped all religious references from the names of months and days and created a new structure of twelve months, each comprising three weeks that were ten days long. Europe's monarchs, concerned that the French abolition of hereditary privilege would cause a domino effect, decided to wage war on France hoping to reinstate the monarchy. In 1792, after attempting to flee Paris, Louis XVI was arrested, put on trial for treason, and ultimately put to death. The execution of Louis XVI on 21 January 1793 is widely considered the beginning of the next period of the revolution, commonly known as the "Reign of Terror." Simply said, the revolutionaries became a bit paranoid and decided they were surrounded by "liberty's enemies" and reacted in consequence. They basically abandoned the idea of a fair and balanced project and began to happily wed themselves to Madame Guillotine (an instrument of beheading). Ironically, the choice of the guillotine as a means of execution was part of the egalitarian ideals of the Revolution, because before its implementation, decapitation was reserved for noblemen. Individuals were executed for a variety of reasons, from insufficient revolutionary zeal (the Girondists, a group that advocated for a constitutional monarchy), excessive revolutionary zeal (Jacques Hébert ), to participation in foreign attempts at overthrowing the revolution (Anacharsis Cloots). The terror finished when its proponent and instigator, Maximilien "The Incorruptible" Robespierre himself was beheaded. What followed (known as the Thermidorian Reaction for the name of the month which it occurred) was the systematic rounding-up and execution of those responsible (more accurately, those perceived to be responsible) for the Reign of Terror. When France's Caribbean colonies got news that the French state was now based on the "universal" values of "liberty and equality" many of the occupants of those colonies pointed out that those ideas were somewhat incompatible with the fact that they were chattel slaves. [note 6] The resulting uprisings brought an end to the slave system in those colonies. Although slavery was reinstated in Martinique and Guadaloupe when Napoleon came to power, the slaves of Saint Domingue (modern-day Haiti) successfully broke from France and became the second free republic in the New World. The popularity of the Revolution would be its ultimate undoing. Revolts against the Revolution in rural provinces and dissent among the empowered, including a large contingent of feminist freedom fighters who had been integral to the Revolution only to have their voices silenced by misogynists in the new government, as well as Catholic insurgents protesting the end of state-funded religion, led to great internal civil strife. Near-continuous war with most of the rest of Europe allowed Napoleon Bonaparte to make a name for himself as a general and paved the way for the coup d'état of 18 Brumaire and the institution of the First French Empire. The actions of the Cardinal Richelieu in the 17th century—attempting to suppress provincial rulers and unite France under one country (all while fighting off the plucky d'Artagnan and his three musketeer friends)—were finally successful when the revolutionary government ended the practice of consuetudinary and abolished the lettres de cachet, ensuring that the entire hexagon would be ruled by the same set of laws. All countries have a mythology that defines who they are as a people and as a nation. 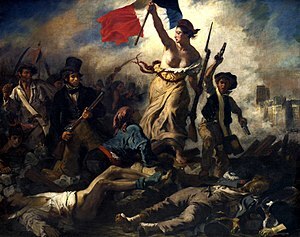 The French Revolution stands out to the French people, differently than the American Revolution does for citizens of the United States, because it was an internal movement against the established government. That has led to a belief within France that "We the people" are not just the ones who elect the government; we can take it down, too. Consequently, French workers are always striking, as part of their French heritage, as if to say, "We are still here. Don't overlook us." Another consequence of the Revolution was the overthrow of the divine right of kings. As a result, the struggle against religion is associated in France with the struggle against tyranny. This line of thought reached its height in 1905 when the French instituted a policy of laïcité, a highly aggressive form of separation of church and state. The musical theme of the French Revolution, "La Marseillaise", was composed in 1792 as a marching song for the Army of the Rhine, and remains the country's national anthem. Mike Duncan of the History of Rome fame has done a 54 episode (not counting about a half dozen "supplementals") super-spectacular on the French Revolution. ↑ Or, more accurately, the swearing of the Tennis Court Oath on 20 June 1789. ↑ The term "peasant" is something of a misnomer here, as this included the up-and-coming urban middle class, which included bankers, lawyers, and individuals now popularly considered part of the upper class. ↑ And very ironically for Louis XVI, as France was a major financial backer of the Americans against the British. ↑ In defense of the revolutionaries, plenty of major figures (such as Jacques-Pierre Brissot and the other members of the Société des amis des noirs) realized this and attempted to abolish slavery. Concerns over the economic impact of abolition (considering that at this time, the majority of the French national income was coming from slave labor) prevented any real reform until slave revolts forced Léger-Félicité Sonthonax to abolish slavery in Saint Domingue in 1793. This page was last modified on 5 April 2019, at 07:04.